Natural Botanical Anise Licorice Liquorice lip balm conditions your lips with pure grade Almond oil, Jojoba oil and Mango Butter. 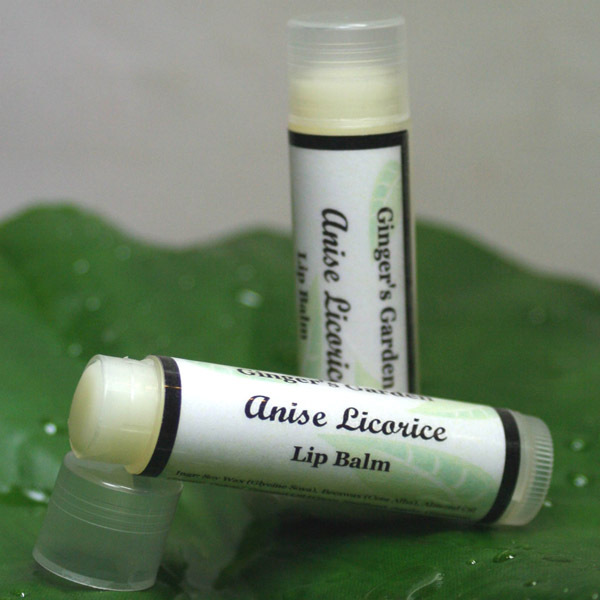 Natural Botanical Anise Licorice Liquorice lip balm conditions your lips with pure grade Almond oil, Jojoba oil and Mango Butter. It's lightly flavored with food grade Anise essential oil and lightly sweetened. If you love licorice this will become one of your favorites! Help prevent chapped and dry lips with natural Anise botanical lip balm with jojoba and mango butter. Comes in a swivel up tube. Each tube comes shrink wrapped for your protection. Soy Wax (Glycine Soya), Beeswax (Cera Alba), Almond Oil(Prunus Dulcis), Coconut Oil (Cocos Nucifera), Jojoba (Simonsia Chinensis), Mango Butter (Mangifera Indica), Vit. E, Anise Essential Oil, Sucralose.